Copyright © 2010, Stephen Hawley, all rights reserved. This past week, my family and I attended the NDSC annual convention, held this year at Disney World in Orlando. My son Stuart went voluntarily deaf, as is his wont, and ended up tripping over his own feet and whacking his head on the hard tile floor. While E and the EMTs looked him over, I registered for the conference with Alice. In the hall, they had a character meet and greet, so I got Alice in line so she could meet Mickey Mouse. A few minutes later, Stuart came in with an ice pack on his head and also got to meet Mickey. While E and I talked about his injury, they switched characters and brought out Cinderella, so we got back in line again. There was a couple waiting behind me - a young man and woman, both with Down syndrome. 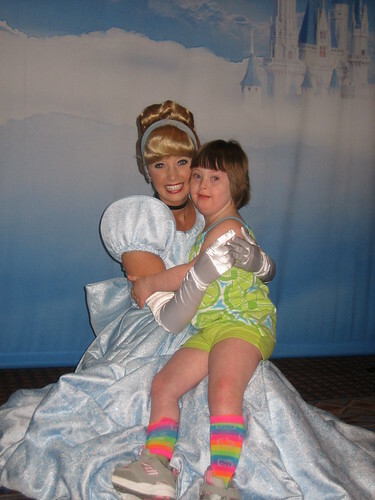 The woman was so excited and bubbly - it was wonderful seeing her bouncing and talking about meeting Cinderella. "omygodohmygodohmygod! I've always wanted to meet her!" I was seeing the same thing in Alice - she could barely contain herself and was yelling, "Cinderella! ALICE HERE!" It was so touching to see Alice give her a hug and ask her to dance. This was the crux of the emotions that I felt again and again during the conference. Down syndrome is a staircase injury. If you push a hundred people down the same staircase, you will have a hundred different injuries. While all people with Down syndrome share the commonality of the 21st chromosome in triplicate, the extras that come along for the ride vary greatly. For me, a lot of Alice's life has centered around what would be taken away, not what would be given. Here in front of me was something that was hers - her own dream made true. No, it was not a huge dream - it was a very simple one, but one shared by girls of all ages: to meet Cinderella and dance with her, if only for just a minute.